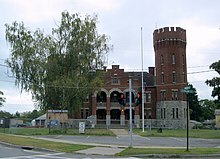 Whitehall is a village located in the town of Whitehall in Washington County, New York, United States. It is part of the Glens Falls Metropolitan Statistical Area. The village population was 2,616 in 2011. In the village, the population was spread out with 25.9% under the age of 18, 8.8% from 18 to 24, 26.5% from 25 to 44, 21.2% from 45 to 64, and 17.6% who were 65 years of age or older. The median age was 38 years. For every 100 females, there were 90.4 males. For every 100 females age 18 and over, there were 86.9 males. Amtrak, the national passenger rail system, provides service to Whitehall, operating its Adirondack daily in both directions between Montreal and New York City. ^ "Administrative boundary of Whitehall, NY from OSM". Retrieved April 4, 2014. This page was last edited on 13 May 2018, at 15:24 (UTC).